To celebrate the grand opening of the flagship store in Miami, Natuzzi launched Open Art, a project born in 2007 with the aim of bringing art into Natuzzi stores and make it accessible to all. 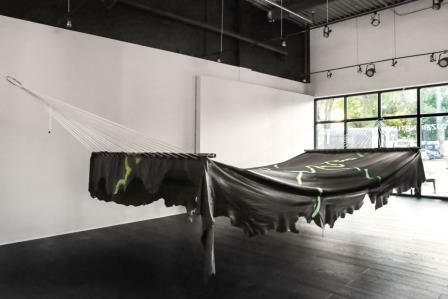 On last December 2nd, during the Miami Art Basel – one of the world’s most famous international exhibitions of modern and contemporary art – artist Adrien Missika (Paris, 1981) exhibited the site-specific installation [ham-uh k]. In continuation of his project Siesta Club, which saw him install a set of hammocks in different parts of the world inviting visitors to stop and relax, Missika designed for Natuzzi an oversize hammock, which can accommodate several people. Several well-known artists have already worked for Natuzzi in recent years: in 2007, at the Salone del Mobile in Milan, the great Italian sculptor Arnaldo Pomodoro exhibited some of his works; following, also Giacomo Benevelli, Nicola Del Verme, Gianni Basso and Fabrizio Plessi have collaborated with Natuzzi.